A selection of the technology used on the first Coordinated Robotics expedition. R/V Falkor will serve as a base of operations for teams of roboticists from the University of Sydney, Woods Hole Oceanographic Institution, Massachusetts Institute of Technology, University of Rhode Island, and University of Michigan, to deploy a fleet of autonomous vehicles to gather data in and around the ʻAuʻAu channel. Along the coasts of west Maui, this integrated reef ecosystem includes some of the most extensive and diverse mesophotic coral ecosystems in the world. The engineers will test and gather observations related to several challenges in robotics and machine learning, while improving our understanding of the relationships between bathymetry, robot-gathered images and quantitative habitat information. The different vehicles have varying specialties, including mapping, imaging, sampling, and gathering data. This expedition will help to create a framework for multiple vehicles operating at the same time and in the same space, markedly improving the ability to effectively gather data for high level characterization of marine environments to guide autonomous survey planning. This work follows the 2015 Coordinated Robotics cruise completed on Falkor in the Timor Sea region. 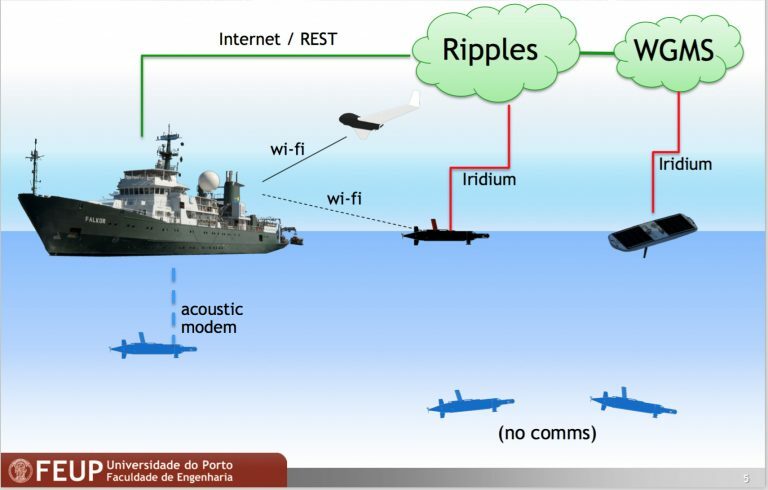 The focus on high level automation of multi-robotic cooperative planning and marine ecosystem characterization will allow for the development of new methodology, advancing high level autonomy in multi-robotic systems. Ocean microbes produce at least fifty percent of the oxygen in our atmosphere while removing carbon dioxide. They are the foundation of every marine food web, which supports our global ocean fisheries. Principal Investigators and SCOPE co-directors Drs. David Karl and Edward DeLong, their SCOPE team from the University of Hawai’i plus six additional institutions, and engineers from the Monterey Bay Aquarium Research Institute (MBARI) will be working together to test new ways of adaptively sampling oceanographic features, to better understand the role of microbes in ways never before possible. This expedition will use a suite of oceanographic instruments to survey and track systems of currents – called “mesoscale eddies” – that exist within the North Pacific Subtropical Gyre (NPSG). These eddy systems create vortices and change properties of the ocean environment inside as they move westward, impacting the productivity and cycling of the NPSG, an important open ocean ecosystem. The SCOPE team will deploy three seawater-sampling Long-Range Autonomous Underwater Vehicles (LRAUVs) from Falkor, while operating in tandem with SeaGliders, Wire Walkers, and other robotic platforms. The LRAUVs will characterize the eddy system, map the depths where enough light penetrates for photosynthesis, and take chemical and biological samples from within eddy systems, providing a unique insight into their duration, stability and influence on the ocean systems. This information will be used to improve current ocean models, which are critical for developing expectations on the health of future oceans. White sharks are predacious, warm bodied sharks known to forage around pinniped colonies along the west coast of North America. Principal Investigator Dr. Barbara Block, Stanford University, and her team, have been using satellite tagging to track shark migrations for years. 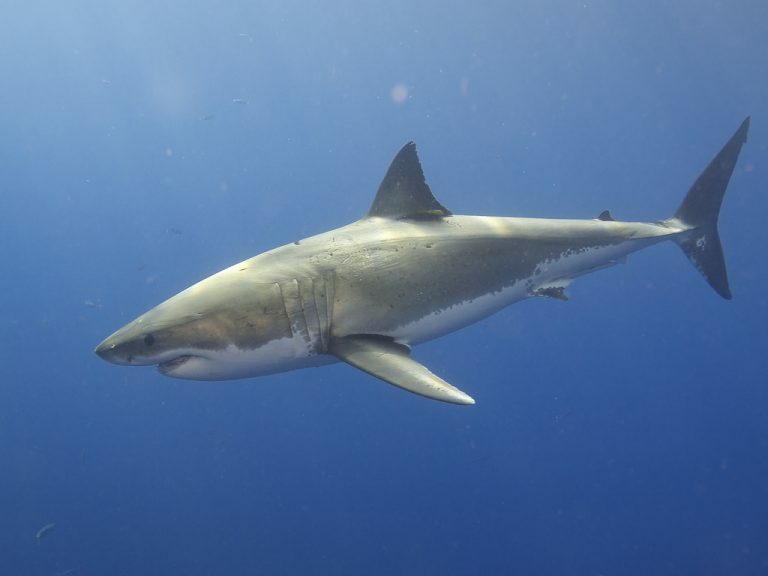 They and other white shark researchers have found that a large number of white sharks in the coastal waters off California and Mexico migrate annually to a virtually unknown and unstudied region halfway between Hawaii and Baja. This area has been nicknamed the “White Shark Cafe,” but why these apex predators leave the prey-rich California coast and migrate offshore remains a mystery. This expedition on Falkor will take a multidisciplinary team of oceanographers, marine ecologists, and molecular biologists to the Café with the goal of potentially locating tagged white sharks and investigating their oceanographic environment. Building a complete understanding of the sharks’ biology and their role in these offshore pelagic ecosystems requires learning why this midwater area seems to be vital to shark’s ecology. Principal Investigator, Dr. João Borges de Sousa, University of Porto, will lead an innovative multi-vehicle expedition to the Subtropical Front, a sharp boundary between cool, fresh, northern waters and warmer, saltier southern waters. 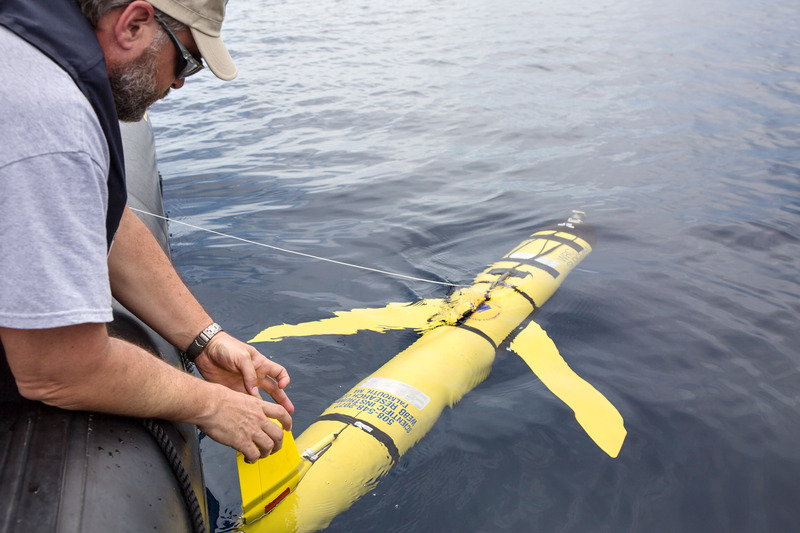 In this area of differing conditions, the team will deploy several autonomous vehicles to find, track, and sample physical, chemical, and biological features of the ocean on time-space scales not previously possible by ship or aircraft studies alone. 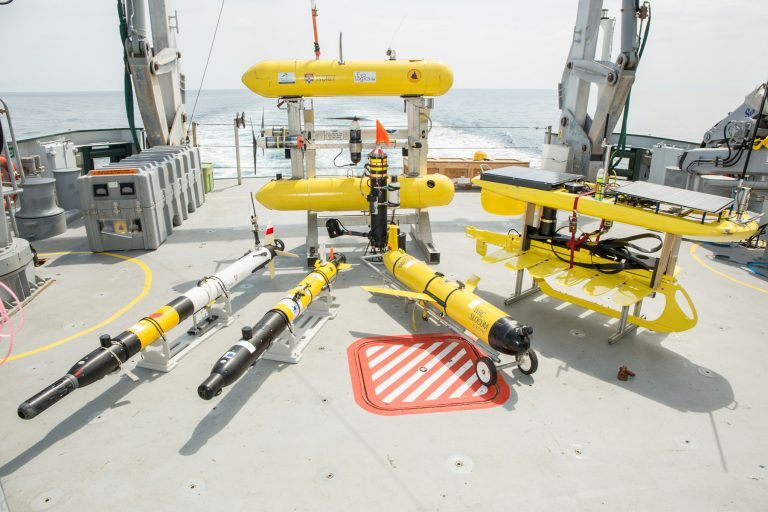 The overall goal is to establish a new method for observing the ocean with unmanned aerial, surface, and underwater vehicles orchestrated from an ocean space control center aboard Falkor. The international team from LSTS and CIIMAR, Porto University in Portugal; Technical University of Cartagena, Spain; Norwegian University of Science and Technology, Norway; and Harvard, University of Rhode Island, and Lamond-Doherty Observatory in the United States, will utilize the collected data for planning and execution control to coordinate the vehicles performing complex sampling tasks. This expedition is focused on optimizing autonomous robotic survey, operations, and planning processes, as it is returning with new, insightful data. Unique to this mission, an anthropologist will be onboard looking at how best to organize the interactions among the engineers, scientists, and vehicles as the robots gain higher levels of intelligence and autonomy. The quantity of “fixed nitrogen” (usually ammonium and nitrate) in the ocean is critical for the strength of the biological carbon pump. 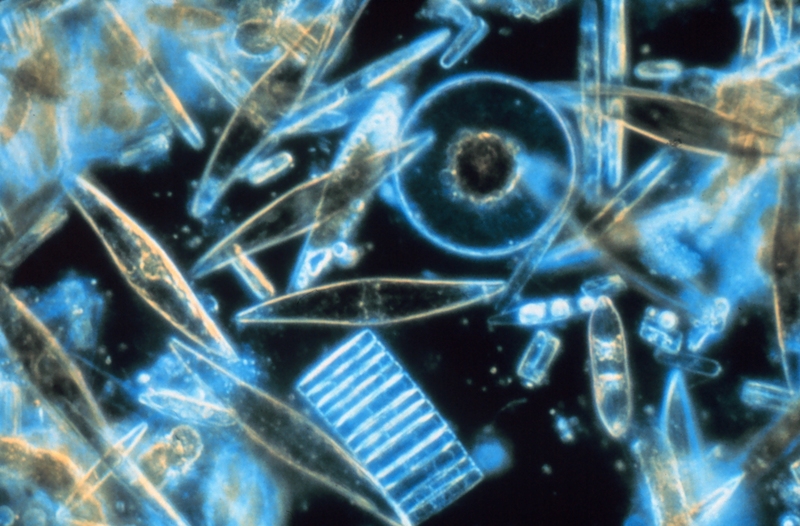 Phytoplankton, which form the base of the marine food web, utilize these nitrogen nutrients for growth. In oxygen deficient zones (ODZs), where oxygen concentrations drop to extremely low levels, microbial processes lead to the conversion of fixed nitrogen into nitrogen gas, which is not available to most phytoplankton. However, these processes and interactions are not well understood. It is difficult to collect, move, and incubate seawater from ODZs without oxygen contamination. Professor Karen Casciotti, Stanford University, and Professor Andrew Babbin, Massachusetts Institute of Technology, and their team will attempt to find a solution. On a three week expedition aboard Falkor, the interdisciplinary team of oceanographers, biogeochemists, and engineers will test, modify, and apply a new generation of autonomous in situ incubation devices that take measurements and record data. They will assess the new device’s performance against state of the art deckboard incubations to determine the new technology’s accuracy, as well as measure the rates and processes of nitrogen transformation in the region. This research will take place in one of the largest natural marine oxygen deficient zones in the Eastern Tropical North Pacific Ocean. As the R/V Falkor transits from San Diego, California to Astoria, Oregon, Schmidt Ocean Institute will take advantage of this route, collecting valuable mapping data for unsurveyed areas over the active Cascadia Margin while hosting a unique group of Artist-at-Sea and Student Opportunities participants. Over the past two years, researchers from Oregon State University have worked on projects over the Cascadia Margin, an area offshore of Washington, Oregon, and northern California. A coordinated water column mapping and data mining effort studying methane seeps has lead to the discovery of over 2,700 new bubble streams at more than 1,000 individual sites. However, the area is still poorly understood – the studies that led to these discoveries covered only approximately one-quarter of the Cascadia Margin area. The mapping effort continued on this expedition will be an important step towards understanding the recent changes in methane seep dynamics and documenting the distribution of these seep sites. Uniquely, this transruise is also Schmidt Ocean Institute’s first artist dedicated expedition. Six unique artists will come aboard the Falkor, using the mapping mission and life at sea as inspiration for their work. The participants’ creations span a wide-range of disciplines- from drawing, block prints, and sculpture, to performance art and jewelry design. Like scientists, artists conceptualize and put together ideas in new ways. By providing a time and space where experts from different disciplines can work together and share ideas, the experience aims to transform both the scientists’ and artists’ outcomes. Two students from Duke University will also be joining the team as part of the Student Opportunities Program. They will immerse themselves in the working of the ship, perform mapping night watches, learn how to clean and interpret the data, and assist in science communication activities. Decisions made in the field play an important role in determining the scientific value of the data products that are collected during research cruises. 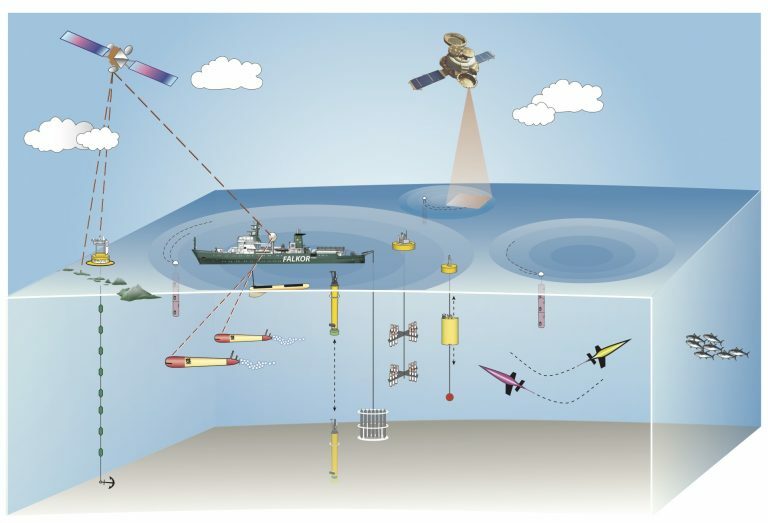 In particular, missions that involve multiple underwater vehicles need to be coordinated and adapted based on up-to-date information as it is gathered, in order to make best use of the available observational capabilities. This expedition led by Principal Investigator Dr. Blair Thornton, University of Southampton (adjunct University of Tokyo), will use on-site sensor measurements for adaptive planning of underwater robotic surveys. The team will perform simultaneous deployments of multiple underwater platforms using 3D visual mapping techniques, along with in­ situ chemical and biological sensing. This will allow the scientists and engineers to gather data in complex and dynamically changing environments like gas ­hydrate fields and cold seeps. The amount of gas in oceanic hydrates is thought to make up a significant proportion of the worldwide natural gas reserves, and scientists believe that gas hydrate fields play an extremely important role in the stabilization of Earth’s climate. They also sustain some of the richest known ecosystems on the seafloor. While these hotspots of biological activity can extend over several hectares, their locations can shift quickly; because of this, stationary observation platforms alone cannot capture the dynamic nature of these environments. Since the time-scales of these changes are relatively rapid, studies need to take place frequently – a difficult and expensive task to accomplish with traditional research vessels. With specialized technology being tested on this expedition, researchers will be able to gather better data in these challenging environments by leveraging information as it is collected to make informed decisions about the observations. By collecting geophysical, biological, and chemical data, the team will create 3D visual reconstructions of ocean floor structures, overlaid with chemical and biological information in the regions that are of greatest interest. Release of methane gas from the land and ocean are thought to be related to historical, large-scale changes in the Earth’s climate. 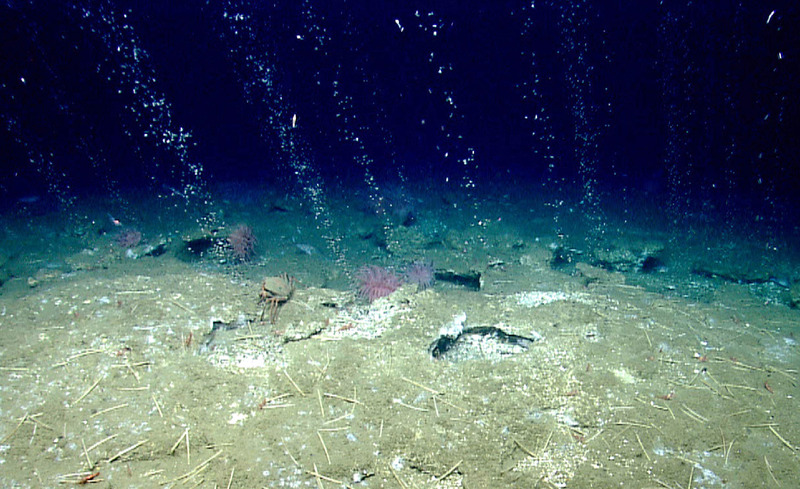 As the result of organic matter decomposition, marine sediments contain the largest known reservoir of methane on the planet. These reservoirs are released into the ocean through a variety of geological mechanisms such as seafloor seeps, hydrothermal vents, etc. Principal Investigators Drs. 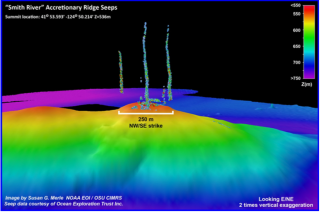 Scott Wankel and Anna Michel, Woods Hole Oceanographic Institution, are interested in studying methane release at Hydrate Ridge off the coast of Oregon in the Northeastern Pacific. Scientists and engineers will collect and analyze bubbles within rising plumes and the nearby water column to understand the processes that govern methane escape and transfer from active release sites to the water column and atmosphere. Using Falkor and Schmidt Ocean Institute’s remotely operated vehicle SuBastian, the team will implement several new cutting-edge technologies including novel in-situ chemical and isotope sensors, advanced shipboard analytical techniques and instrumentation, novel deep-sea stereo imaging capabilities, and advanced molecular biological approaches. 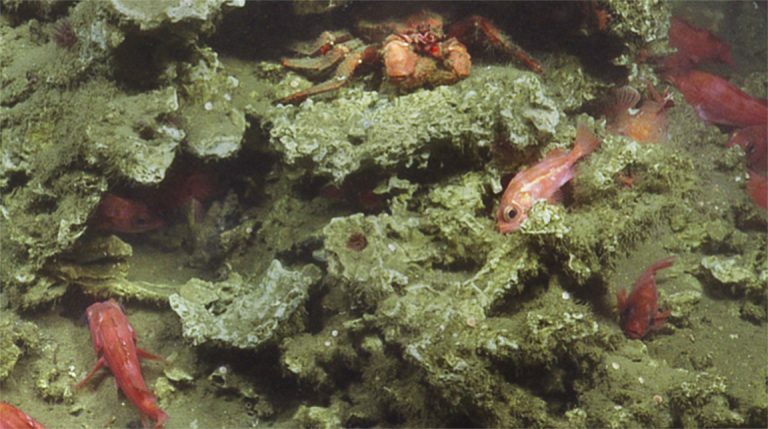 Carbonate vent harboring numerous rockfish. Image courtesy of Ocean Exploration Trust. Courtesy of Ocean Exp. Trust. The complex ocean floor off the coast of California is known as the Southern California Borderland. This is an area with varying geographic features such as vents and seeps and is constantly undergoing change. 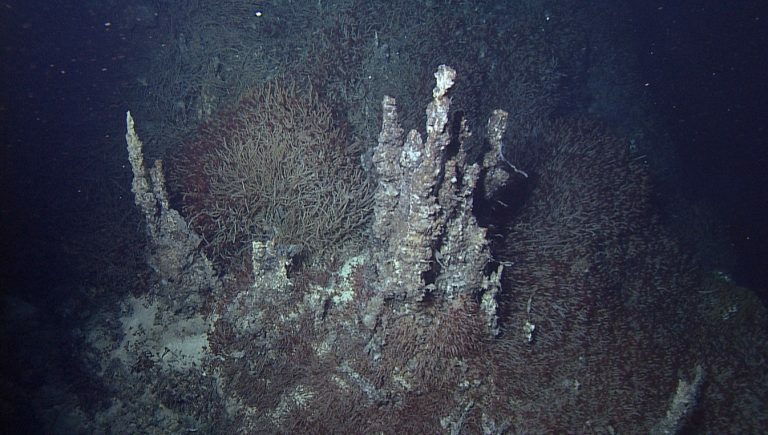 Although hydrothermal vent and hydrocarbon seep systems have been widely studied, there are still many long-standing questions about these dynamic ecosystems. This expedition aboard Falkor, led by Principal Investigator Peter Girguis, Harvard University, seeks to conduct an ROV-based geophysical, geological, geochemical, and biological characterization of the venting and seepage in the Southern California Borderland. The science team will use this information to determine if the vents and seeps in this area are biologically relevant sources of dissolved gases and metals to the coastal water column. This research will also gain insight into how the biology at different sites is related, and the path that fauna took to get to such isolated sites. Lastly, the team will be looking for evidence that the vents and seeps support ecosystems by providing valuable habitat, food breeding, and nursery grounds to species that don’t live in seclusion in these sites, such as commercially relevant fish. 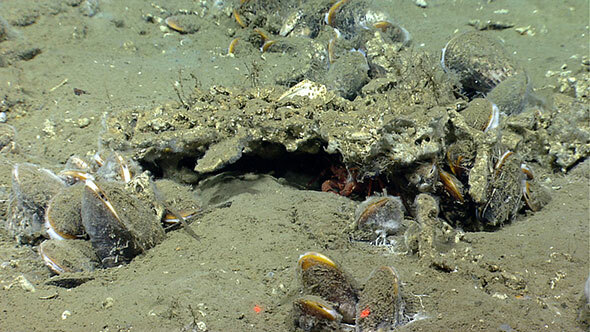 In 2015, a Monterey Bay Aquarium Research Institute (MBARI) led research expedition to the Gulf of California discovered a distinctive hydrothermal field in the Southern Pescadero Basin. In 2018, a science team led by Principal Investigator Robert Zierenberg, University of California Davis, will return aboard Falkor to conduct a geological, geochemical, and biological study of this new vent field. This interdisciplinary research seeks to understand the ecosystem transitions from seeps to vents, and the various implications for the associated environments. This includes all of the interactions that relate to tectonics, biogeochemistry, microbiology, and ecology. 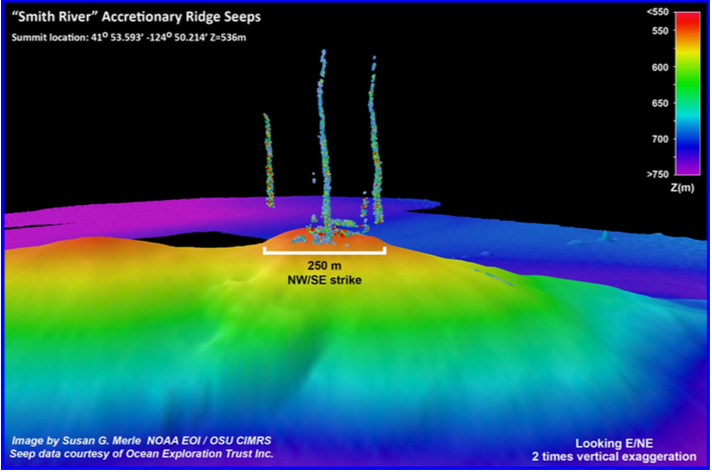 The cruise will use a nested-scale mapping approach starting with shipboard multibeam mapping to establish the general bathymetry and tectonic setting, a MBARI developed autonomous underwater vehicle (AUV) to identify smaller scale (meter grid) tectonic features and their relationship to hydrothermal deposits, and a multibeam-LIDAR-camera system developed by MBARI mounted on Schmidt Ocean Institute’s remotely operated vehicle ROV SuBastian to map species distribution and habitat, and allow targeted sampling of subseafloor microbial communities. The science team will sample vent fluid, hydrothermal deposits, sediment cored, pore-water, and heat flow to establish the geochemical context and assess densities, distribution patterns, and diversity of associated fauna. Autonomous robots exploring hazardous environments present enormous challenges and potentially great rewards. With the exception of a thin layer of Earth’s surface, our planet and the rest of our solar system is inhospitable for humans. Over the past few decades remotely operated vehicles (ROVs) such space probes, Mars rovers, and underwater robots here on Earth have provided breathtaking insights in otherwise inaccessible regions of our universe. The operational requirement for remote human control of these robots, however, fundamentally limits their speed of exploration and mission complexity. Autonomous robotics holds great promise for accelerating the pace of scientific discovery while also advancing new technologies for modern life, ranging from self-driving cars to improved medical diagnostics. While aboard the R/V Falkor, principal investigator, Dr. Richard Camilli of the Woods Hole Oceanographic Institution, and his team of researchers will test new methods for autonomous exploration of deep sea biological oases off the Costa Rican Pacific shelf break. Their focus seeks to improve autonomous vehicle survivability and mission completion while decreasing the need for human intervention. During this expedition autonomous robots will be tasked with completing survey and sampling operations in complex natural environments containing unknown hazards. Insights gained here will be useful for understanding the interconnections of these chemosynthetic ecosystems, while providing planetary scientists with improved search strategies for investigating life and associated habitats that may exist elsewhere in the solar system.